Pretty rose gold makes this sculptural-inspired V bar necklace in 14K rose gold in 16" - 18" from Apples of Gold Jewelry stand out! The sweet pink hue of the rose gold gives this necklace a special touch. The V shaped bar pendant measures just over 1" wide and is 3/8" tall. 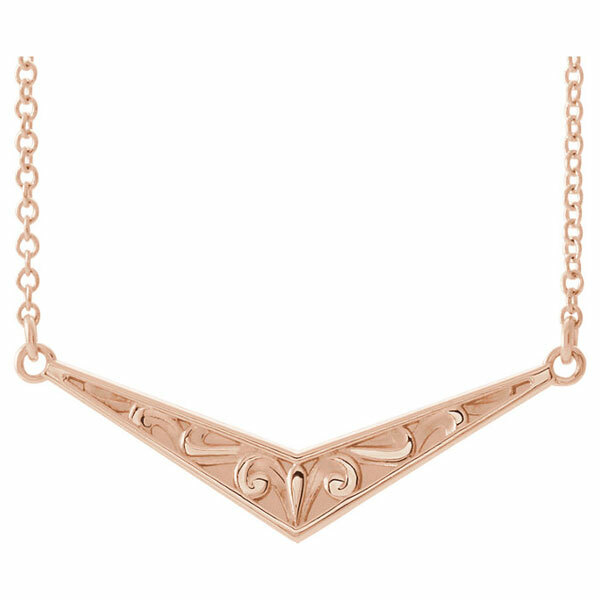 Along the outside of the pendant is a smooth rose gold border, while the inside features a swirling, sculpture inspired pattern. The chain that attaches to both sides of the pendant is available in your choice of 16" or 18" lengths, and is a 1mm cable chain with a spring-ring closure. This unique necklace looks great for casual wear or special occasions.